Forward Controls Design is the latest endeavor of Roger Wang (formerly of Battle Arms Development), whose goal is to refine and augment firearm’s human interface controls. 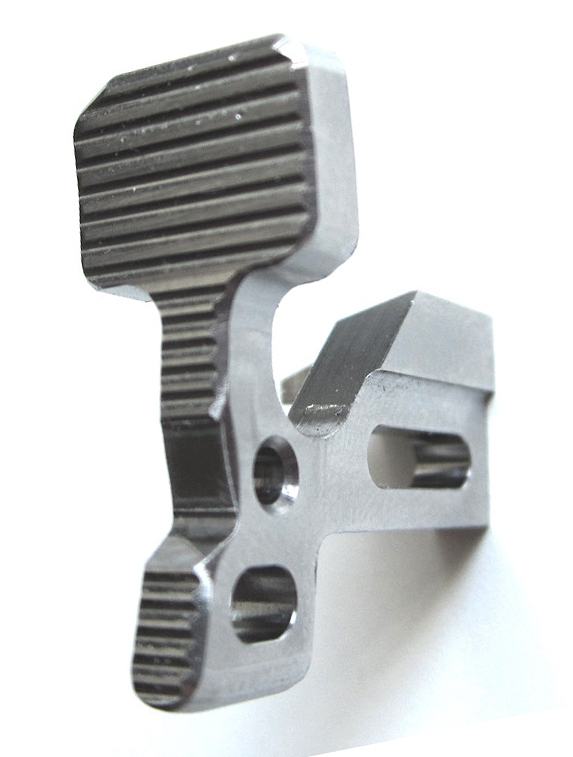 One of their debut products (yet to be officially named) will be an upgraded bolt catch for AR-15 type firearms. It will be referred to as the FCD BC (Forward Controls Design Bolt Catch) for the remainder of this article. Throughout this article, please keep in mind that this part is a prototype and the final version will be melonited black and will not have any of the tool marks or pitting visible in these photos. 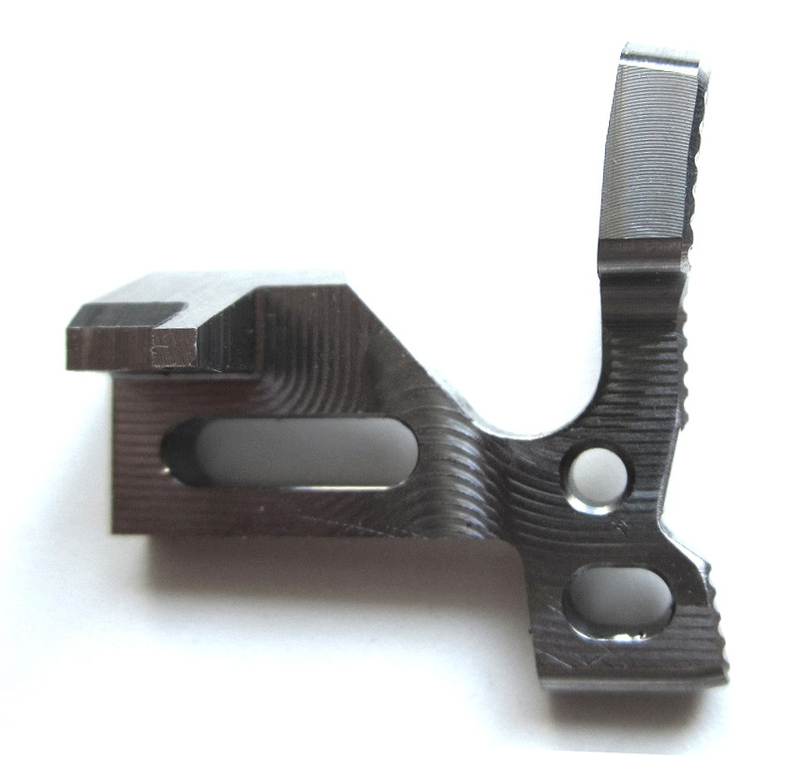 The FCD BC adds a few features over your standard bolt catch which aid the shooter in manipulating the bolt catch. The FCD BC features a slightly enlarged top paddle. The top half of the paddle is canted at a 10 degree angle, while the lower portion is canted at 5 degrees. 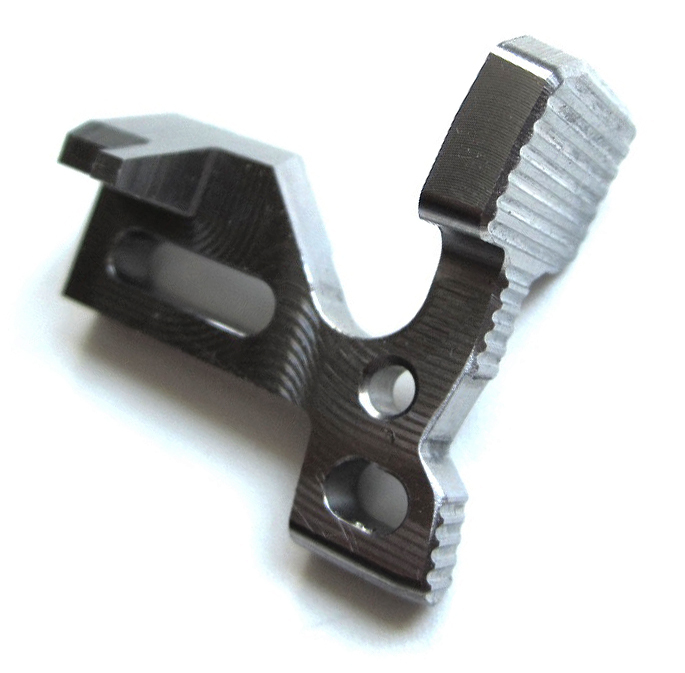 This increases the tactility of the bolt catch once it has engaged and locked the bolt carrier group to the rear of the firearm. Directly underneath the enlarged paddle there is a further serrated area. This textured area serves two important tactile features: the first is that it gives the user even more purchase when manipulating their bolt catch, but it is also an indicator of where your finger is positioned on the bolt catch (more on this in closing). The FCD BC’s lower half features another smaller “paddle” area. This particular area was designed in mind with using AR-15 lower receivers equipped with ambidextrous magazine releases. Some ambidextrous magazine releases can make using a standard bolt catch more difficult to manipulate. With or without such a device, the added textured area allows the user even more purchase when manually locking the bolt carrier group to the rear of the firearm. This can be a vital task if your firearm happens to malfunction, and the FCD BC aims to make this more intuitive for the user. My first impressions are limited, as the PolyJet prototype at SHOT Show 2015 was accidentally broken before I was able to see it. However, combining that knowledge with the first look of this product I am convinced it will be a noticeable upgrade to the AR-15 platform in a sleek package. I am interested to see how much easier it will make manually locking the bolt carrier group to the rear. 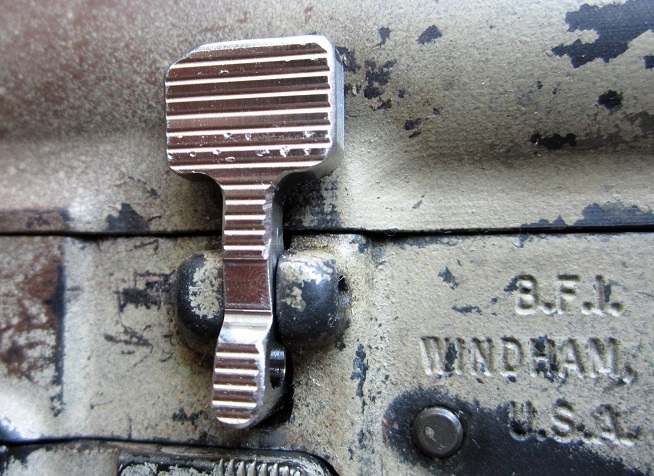 The added tactile purchase of the FCD BC over the OEM bolt catch should be immediately evident to those people who enjoy shooting their AR-15s with night vision devices or in low light environments. HP will have a follow up review when the finished product hits shelves later this year. In the meantime, you can keep up with Forward Controls Design via their Facebook and soon-to-come website.